I agree with that completely John. I bought it heavily at 1300 yesterday as my model says we should hit 1342 by the end of tomorrow. There seems to be buying-pressure expected next couple days (rising tick). Bearish opening gaps can sabotage this, but with flat or bullish open we should go up. So next two days into the weekend are imortant to gain hight. If sabotaged, we look very vulnerable after the 3-day holiday, when tick may point down. 1420 seems a long way off……I will be running for the hills if we take out 1296…….. Heed to the world’s uncertainties while waiting for the next QE. Until then,…stand down and relax. And what if the next QE doesn’t work apart from a short term sugar rush? Twist and LTRO failed to push risk assets to new highs. Another mild program, like Twist extension or LTRO 3, could actually disappoint investors and CRASH the markets! Citi’s Economic Surprise Index for Major Economies (CESIG10) broke below the base it was trying to form, down to -33 at present time. Overnight EUR data was not pretty either. The CESI for the US has still flatlined/basing. 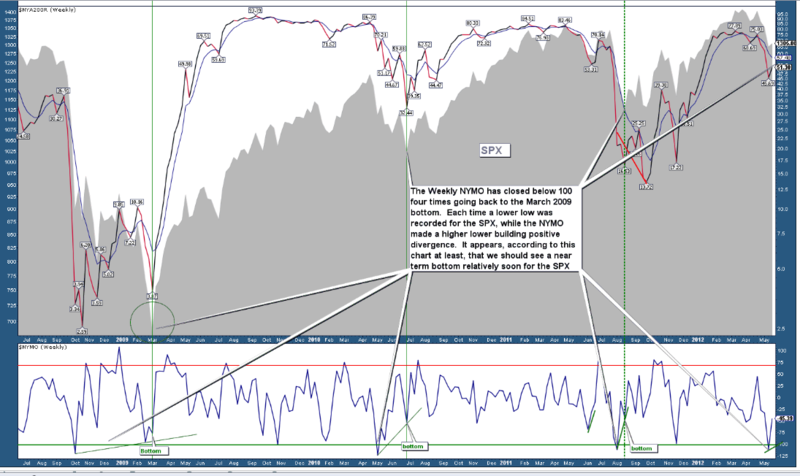 IF SPX does not go down tomorrow, I have a buy-signal that normally comes at a new ~70day cycle (or 15 week cycle) – or 6month cycle if that one is dominant now. Should the market be in a trough around June 4-6 and a crest into June 10-12, then we could potentially get a pretty good sell-off into the end of June/early July period…which coincides with the Greek vote timing. FXE is currently trading below a critical support at 125 today and in a potential bear flag. Should we get a sell off into the end of June/early July, and the Euro continues to break down, I have a potential support level of around 117 on the FXE…. Most indices and VIX related indicators are trading in a triangle which can usually indicate more down in a downtrend….we shall see which way it breaks out. 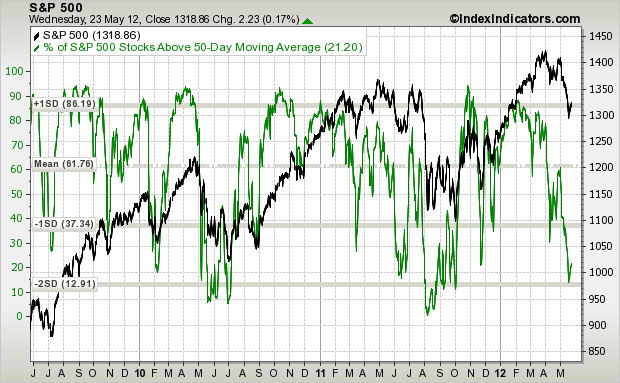 If we don’t get a significant rally here in the next couple of weeks, we could definitely take out the 200dma. QE would most likely change the outcome and prolong the rally into 2013 as we are all expecting…. Friday morning, not much to add. Markets appear to be shaping out a bottom with a bit of back and forth, but still tentative. CBI returned to 1, so that advantage is now over. 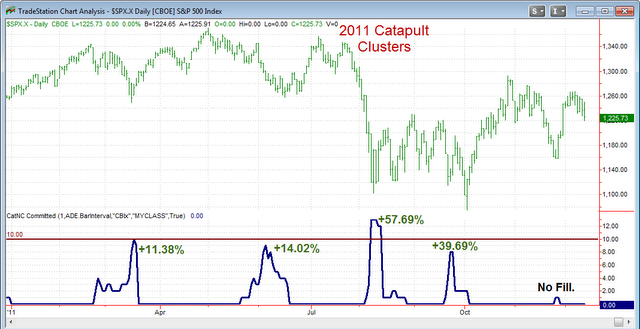 Insiders are buying at the kind of levels that previously marked important bottoms (from TSP Talk). See how today shapes up. John is it normal for CBI to fall that quickly? It’s normally fairly swift. See the blue line on the Quant Edges chart above. By the way, for those who thought the Eurozone debacle could get no worse – try watching the Eurovision Song Contest tomorrow night! I am toying with the thesis that the European powers that be have embarked on a stealth, controlled devaluation of the Euro (see Jeremy Siegel article in the FT a couple days ago) and the many that are short it per COT stats will turn out to be right this time. It also means Euro price action shouldn’t be viewed as a risk-on, risk-off barometer as it’s being manipulated by far stronger forces. European powers have no control over anything, let alone a “controlled devaluation of the Euro”. Nonetheless, since Euro short is the most overcrowded trade in the world, so I wouldn’t blindly short it right now. I’d rather expect a catalyst to create a short squeeze instead. Tiho, perhaps controlled isn’t the right word – maybe intentional is more suitable. My point isn’t really whether such policy is controlled or intentional; rather it’s to raise the possibility the Euro could continue to decline and much more than people think – due to the benefits a devaluation provides. I’m suggesting those who are long the Euro strictly because it’s “contrarian” should carefully re-examine their premises. I agree, but I think the answer is much more simple than that. I believe a currency cannot be controlled. How many times have you see Japan or Switzerland trying to stem currency appreciation? And how many times has it worked? Sometimes over the short term, but never over the long term. The Euro is going lower because the recession in Europe is intensifying, which the market is discounting in form of further rate cuts by Draghi, lowering Euro’s yield advantage against the Dollar. Remember that ECB stands at 1% while Fed at 0.25%. The ECB could go as low as BoE, towards 0.5% rate. That would seriously hurt demand for Euros globally by major funds. And if the European recession spreads globally, as some smart investors seem to think, we could have a powerful capital flow into United States as a safe haven just out of fear of Lehman repeating. This would create even higher demand for Dollars, and push up the price. Finally, since majority of debt globally is still denominated in Dollars, a banking default of some kind similar to the Lehman event in 2008, could create shortage of US Dollars between banks internally, which would also be a catalyst for short term demand. All in all, events exist where Dollar could go higher without a doubt. But as I said above, I wouldn’t blindly but Dollars right now. I’d rather expect some catalyst to create a Euro short squeeze instead, at least for awhile. Positioning is super extreme! I am short both Yen and Swiss francs right now. I am long Canadian dollars, Australian dollars, and US dollars. I am long the euro against the franc as well (right at 1.20). The BoJ and SNB have defended certain levels recently and I expect them to do the same for the near term and if nothing else, as price moves closer to their triggers, speculators will stand back and close positions. Of course, that is what both the BoJ and SNB would like first prior to them having to step in and stem the strength of their own. Whether these hold in the future is another question, but right now it is working. Don’t fix it until it breaks. Yep – agree with you. As I suggested to John, it’s all game theory now for markets. What is in everyone’s interest? I would argue the Euro moving lower is just that, helping Europe’s southern arc become more competitive, while at the same time forcing China to move away from its mercantilist policies and act to stimulate domestic consumption (which it needs to do in any event), and the U.S. accedes because a devaluation helps to stabilize a tenuous situation prior to the election in November. Simplistic, perhaps…we shall see.